We love our dogs and we love taking them wherever we go. They are ready at a moment’s notice, never complain about our driving or music selections, and don’t care where we are going (with the probable exception of the vet). Dogs are amazing sidekicks and co-pilots. We’d take them everywhere if we could. Lucky for us (and Fido), more businesses are starting to welcome (wo)man’s best friend. If your dog is a certified service dog, he is allowed wherever you go. If not, southeastern Minnesota offers many dog friendly businesses where you can socialize Fido with new people and introduce him to new places. Check out the following list for some expected and a few unexpected dog friendly businesses. Be sure to keep Fido on a leash and be ready for lots of cooing over how cute he is. From chains like Petco, Chuck and Don’s and Petsmart to local stores like Rochester Pet & Country Store, pet stores are usually accommodating to our four-legged friends, and there are often treats at the register for well-behaved pups. Pet stores are perhaps a bit more tolerant of…um…accidents than other businesses may be, as well. Be prepared to run into other pups along the way, and you can’t possibly leave without a new squeaky toy, right? More and more restaurants are welcoming dogs at their outdoor tables. From Forager Brewery and Five West in Rochester to B&J Bar and Grill in Austin to Mandy’s Coffee and Café in Red Wing, outdoor dining opportunities abound for you and your furry friend. In general, restaurants with outdoor dining are often welcoming, but call ahead if you are unsure. Look for a table in the shade and request a bowl of water for Fido. It’s a “yes to pets” from these big box retailers. While you are there, maybe scope out needed lumber and tools to get that new dog bed or backyard agility course project underway. Stores include Home Depot (Voted 2018 Best Pet Friendly Business by Wagazine readers), Lowe’s, Fleet Farm and Tractor Supply Company. Your pooch may not be able to read (yet), but she will have a great time as you scope out your next summer series. They may also have books on making peanut butter dog treats. Just saying… Stores include Book Review (Rochester) and Fair Trade Books (Red Wing)—Make sure to say “woof” to Reveler the bookstore dog! At Affinity Plus Federal Credit Union, it’s all about the Benjamins—and the treats that they have at the counter. Fancy a bit of wine? 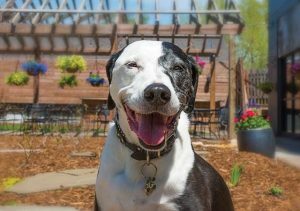 Tour the Falconer Vineyards & Winery (Red Wing) grounds and relax in the great outdoors with your best friend. Need a little retail therapy with your best friend? These stores welcome dogs through their automatic doors with open arms. You’ll look smashing in your new duds and maybe pick up some doggy gear, too. Stores include TerraLoco (Rochester), TJ Maxx, Scheels and Old Navy. These shops welcome Fido along with your ride. Heartland Tire; and Tom Kadlec Honda (Rochester) offers a dog park for some play time and energy burn while you wait for car service. Googly eyes, glitter and your pup—what could possibly go wrong? Bring your crafty canine to Hobby Lobby and Michaels. Erin Pagel is a Rochester freelance writer and dog lover.